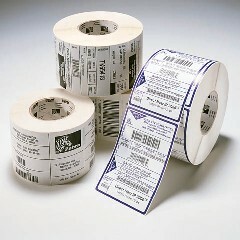 Zebra Z-Select 4000T Thermal Transfer Barcode Labels (2.25 Inch x 0.75 Inch; 3320 Labels/Roll, 6 Rolls/Case). Gap Sensing. Meets FDA 175.105 indirect food contact requirements. A Premium thermal transfer paper label with a permanent acrylic adhesive. Specially coated to provide optimal performance. Recommended for indoor use.